Archbishop Lefebvre liked to say often that the priest is made for sacrifice, that he is ordained for the offering of sacrifice. This is an essential, “transcendental” ordination or ordering: just as there is no sacrifice without a priest, so too there is not priest without the sacrifice; this is what constitutes priestly identity. By “memory” or “remembrance” we must understand not only a subjective or collective memory, but a memorial, that is, the objective action that takes place at the altar. The re-presentation under consideration here is none other than the reenactment of the Passion and death of Christ, manifested by the separate consecration of the Body then of the Blood, an action suited to represent the bloody separation and outpouring of blood that accompanied Christ’s death on the cross." 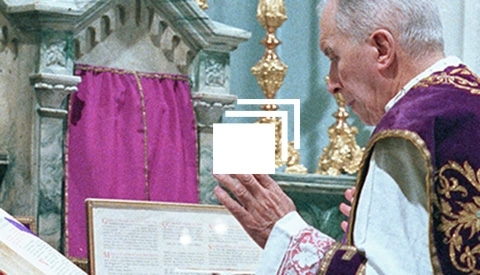 Marcel Lefebvre often recalled the four ends of the Sacrifice of the Mass: praise of God, thanksgiving (hence the name Eucharist), propitiation (or atonement) and impetration (or intercession). Unlike the modernists, he insists on the propitiatory aspect: God who has been offended is made propitious by His incarnate Son’s act of extreme charity in offering Himself on the cross. But he also loves to elaborate on the praise and glorification that the Mass procures for God. Most importantly, he teaches that Holy Communion is communion with the Victim on Calvary and that under this aspect “it transforms us into victims in union with Jesus the Victim”, an effect that is not often recognized. Archbishop celebrates his Mass in the private chapel of the Seminary in Econe. 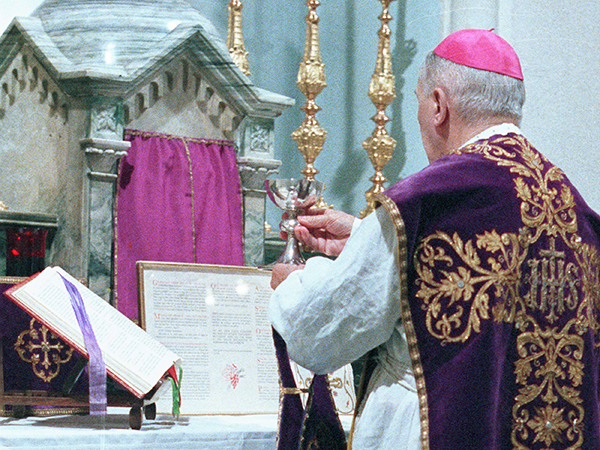 The Holy and traditional Mass expresses the entirety of the Catholic doctrine. "The sacrifice of Calvary becomes on our altars the sacrifice of the Mass, which, as it continues the sacrifice of the Cross, brings about the sacrament of the Eucharist, making us participants in the divine Victim, Jesus Crucified."